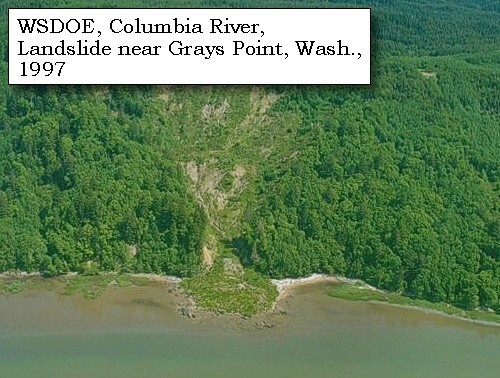 Lewis and Clark's camp of November 8 and November 9, 1805, was on the Washington side of the Columbia River, west side of Grays Bay, at a place now called "Grays Point". Grays Point was charted by Charles Wilkes in 1841 and named to honor the American explorer who first explored the Columbia River in 1792. 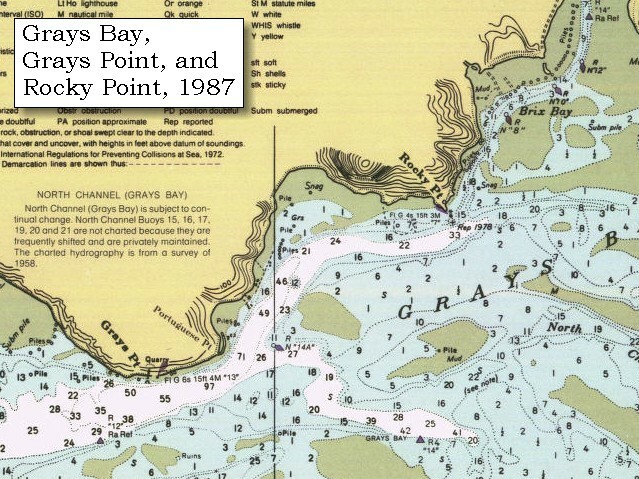 Grays Point is the western point of Grays Bay. 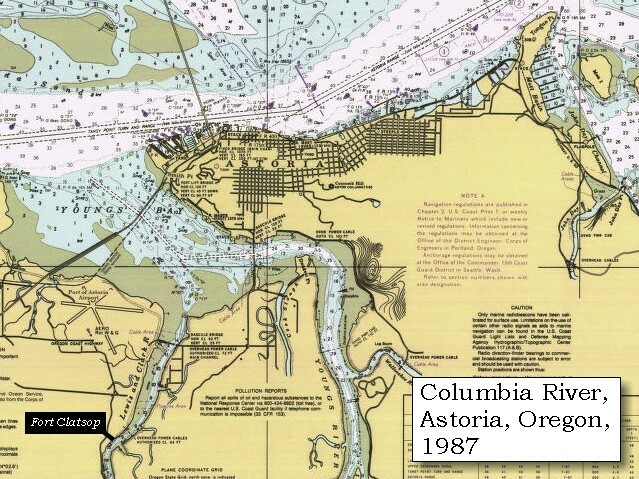 -- Washington State Historical Society Website, 2004, "Lasting Legacy"
2004, West side of Grays Point, Washington, as seen from the old Knappton Mill pilings off of Washington State Highway 401. (Click to enlarge). Copyright © 2004 Lyn Topinka, private archives, used with permission. 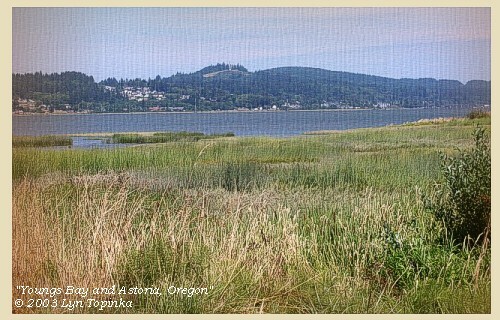 while on the opposite side is a large bay [Youngs Bay, Oregon side], above which the hills are close on the river. Youngs Bay is a shallow body of water just west of Smith Point. 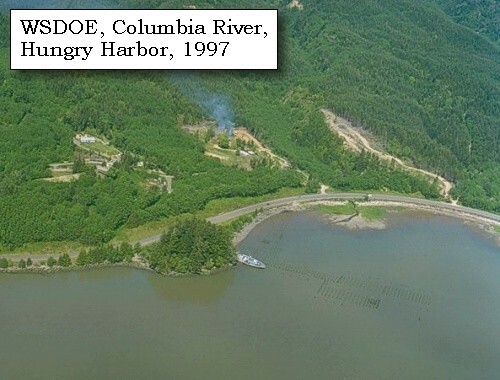 The bay is crossed by U.S. Highway 26/101 vertical-lift highway bridge, approximately 0.3 mile above the junction of Youngs Bay with the Columbia River. 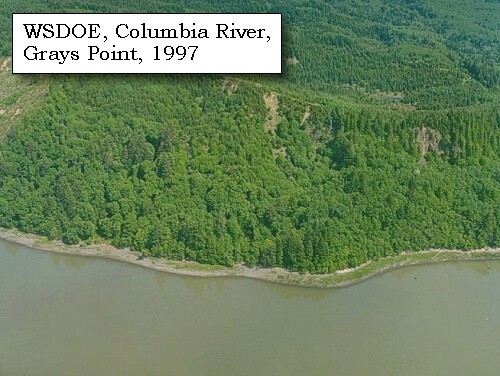 Youngs Bay is a part of the Columbia River estuary. It receives water from four major streams - the Lewis and Clark River, Youngs River, Klatskanine River, and Wallooskee River. 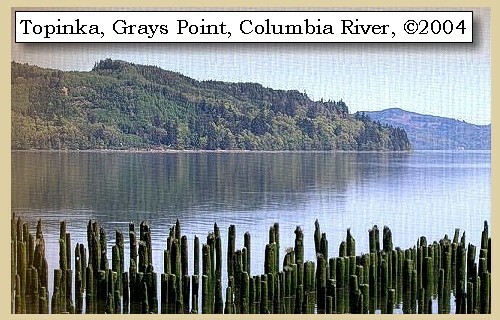 Captain Clark named the bay "Meriwether Bay" after Meriwether Lewis. Today the bay is named after the Youngs River, a river named in 1792 by Lieutenant William Broughton after Sir George Young of the Royal Navy. 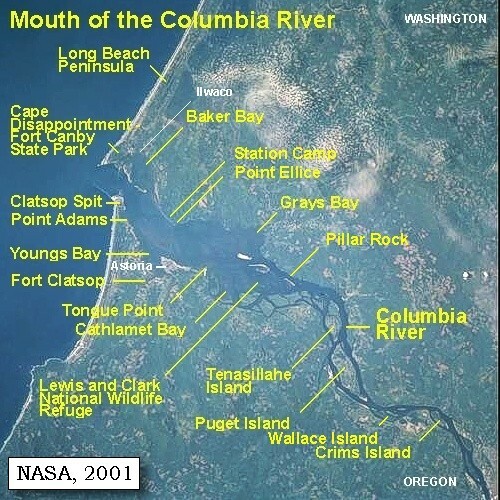 -- NOAA Office of Coast Survey Website, 2003, and Washington State Historical Society Website, 2004, "Lasting Legacy". 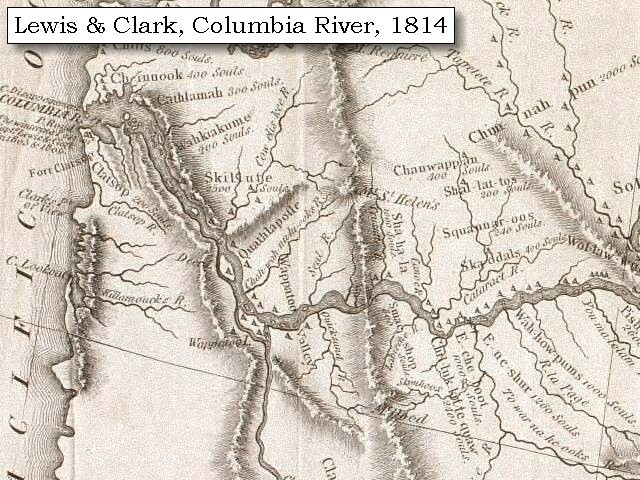 1814 Map, Lewis and Clark's map of the Columbia River (section of original). (Click to enlarge.) 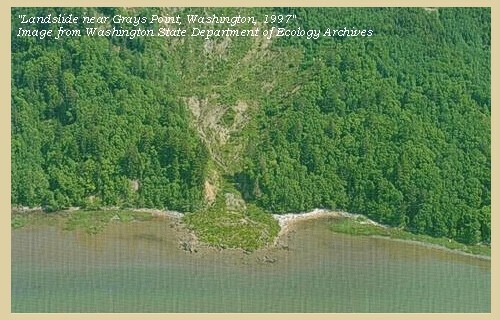 Youngs Bay is depicted but not named. 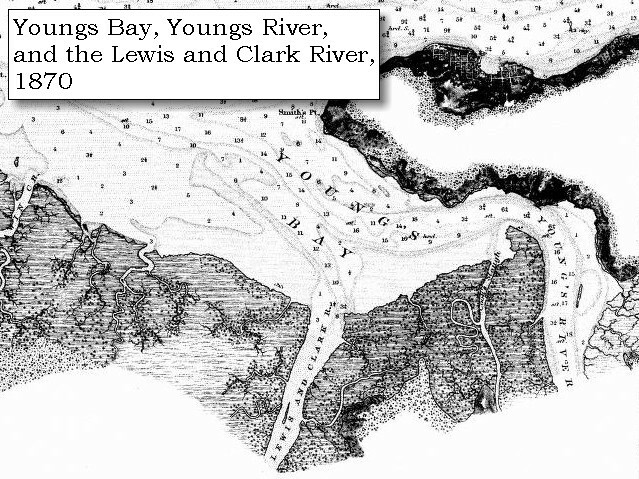 Also depicted but not named are the Lewis and Clark River and Youngs River, both of which empty into Youngs Bay. Map also includes three of the five volcanoes Lewis and Clark saw and commented on. 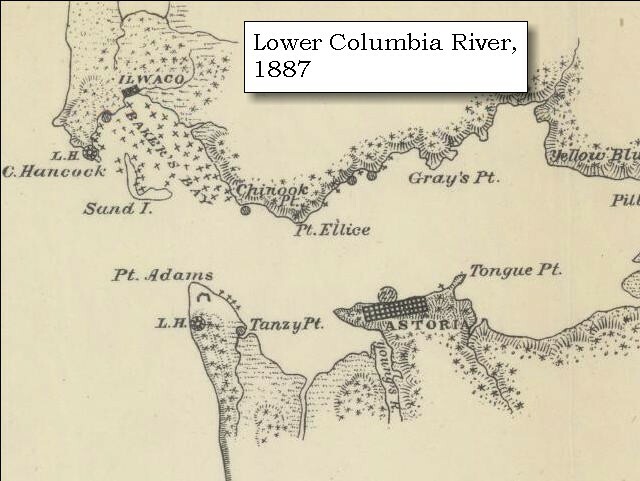 While the journals mention the expedition seeing Mount Adams, it does not appear on their map. Mount Jefferson is to the south (bottom) and off the map. From the "Nicholas Biddle/Paul Allen" 1814 publication. Original Map: "A Map of Lewis and Clark's Track, Across the Western Portion of North America, From the Mississippi to the Pacific Ocean". 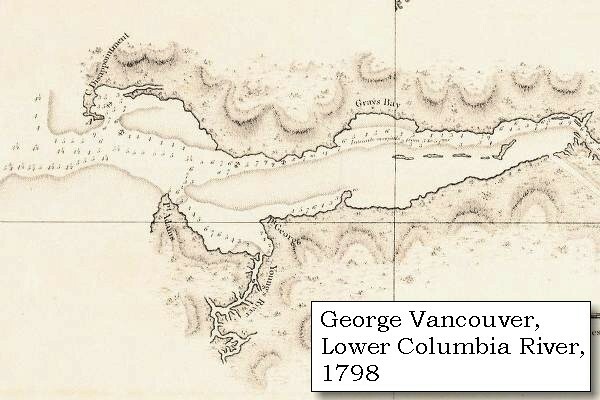 From: History of the expedition under the command of Captains Lewis and Clark : to the sources of the Missouri, thence across the Rocky Mountains and down the river Columbia to the Pacific Ocean : performed during the years 1804-5-6 : by order of the government of the United States / prepared for the press by Paul Allen. Philadelphia : Bradford and Insskeep, 1814. Harold B. Lee Library, Brigham Young University #upbover maps37. -- Brigham Young University, Harold B. Lee Library Website, 2004. 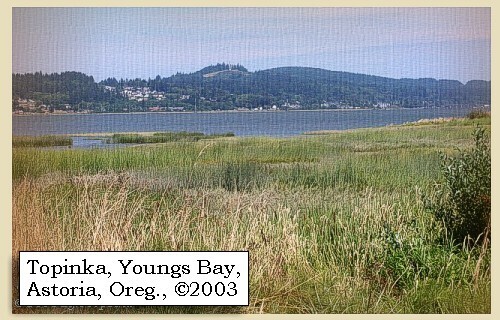 2003, Youngs Bay and part of Astoria, Oregon, as seen from the U.S. Highway 26/101 Bridge crossing the bay. (Click to enlarge). Copyright © 2003 Lyn Topinka, private archives, used with permission. At the distance of ten miles the wind rose from the northwest and the waves became so high that we were forced to return for two miles to a place where we could with safety unload. Here we landed at the mouth of a small run [Hungry Harbor], and having placed our baggage on a pile of drifted logs waited until low water. 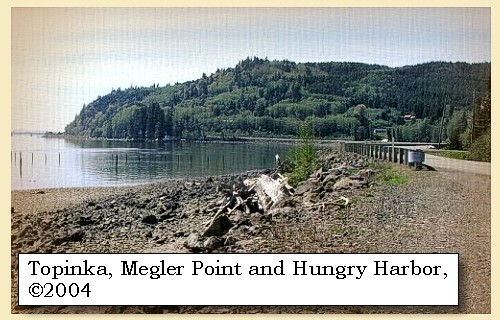 Lewis and Clark spent two nights in Hungry Harbor before relocating on the other side of Megler Point. The river then appeared more calm: we therefore started, but after going a mile found the waves too high for our canoes and were obliged to put to shore. We unloaded the canoes, and having placed the baggage on a rock above the reach of the tide, encamped on some drift logs which formed the only place where we could lie, the hills rising steep over our heads to the height of five hundred feet [near today's town of Megler, Washington]. All as well as ourselves were thoroughly wet with the rain, which did not cease during the day; it continued violently during the night, in the course of which the tide reached the logs on which we lay, and set them afloat. Washington side of the Columbia River, near today's town of Megler. 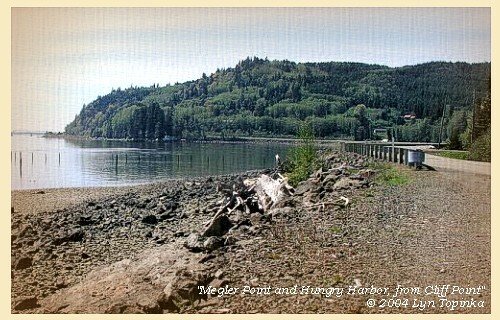 On November 12, the camp moved about 1/2 mile around Megler Point to Megler Cove. The wind was still high from the southwest, and drove the waves against the shore with great fury: the rain too fell in torrents, and not only drenched us to the skin, but loosened the stones on the hill sides, which then came rolling down upon us. In this comfortless situation we remained all day wet, cold, with nothing but dried fish to satisfy our hunger; the canoes in one place at the mercy of the waves; the baggage in another, and all the men scattered on floating logs, or sheltering themselves in the crevices of the rocks and hill sides. A hunter was despatched in hopes of finding some fresh meat, but the hills were so steeps and covered with undergrowth and fallen timber, that he could not penetrate them, and he was forced to return. About twelve o'clock we were visited by five Indians in a canoe: they came from above this place on the opposite side of the river, and their language much resembles that of the Wahkiacum: they called themselves Cathlamahs. In person they are small, ill made, and badly clothed; though one of them had on a sailor's round jacket and pantaloons, which, as he explained by signs, he had received from the whites below the point: we purchased from them thirteen red charr, a fish which we found very excellent. After some time they went on board the boat, and crossed the river, which is here five miles wide, through a very heavy sea. Washington side of the Columbia River, near today's town of Megler. 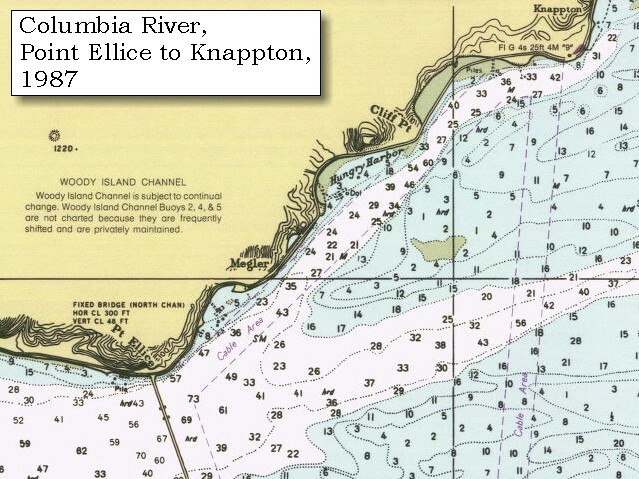 On November 12, the camp moved about 1/2 mile around a Megler Point to Megler Cove.